Monday was the first day of what could be a lengthy legal battle over Senate Bill 4, which has been billed as the toughest state-based immigration bill in the country. Opponents of Texas’ state-based immigration law told a federal judge Monday that allowing the controversial measure to stand would pave the way for a nationwide police state where local officers could subvert the established immigration-enforcement powers of the federal government. But the state’s attorneys argued in tandem with their colleagues from the U.S. Department of Justice that the issue was settled in 2012 when the U.S. Supreme Court ruled in favor of a state-based immigration-enforcement provision passed in Arizona. 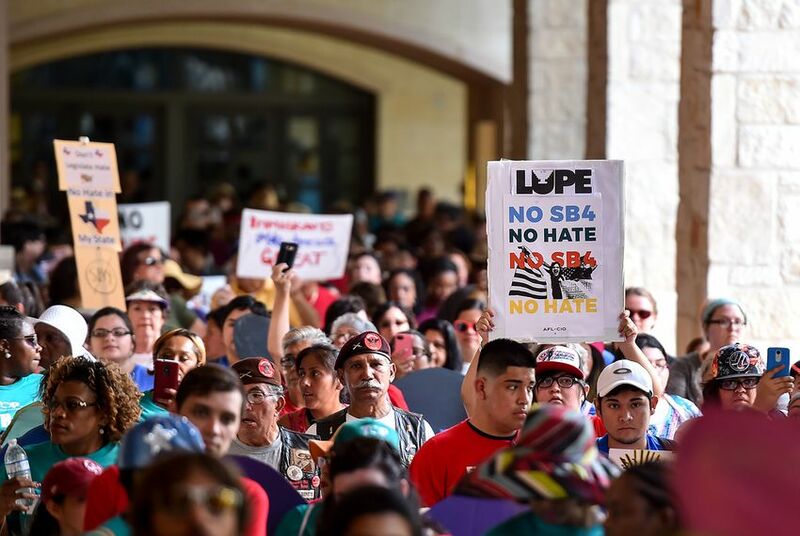 The day marked the first skirmish in what could be a lengthy battle over Texas' law, Senate Bill 4, which has been billed as the toughest state-based immigration bill in the country. Known as the "sanctuary cities" law, SB 4 allows local law enforcement officers to question the immigration status of people they detain or arrest and seeks to punish local government department heads and elected officials who don’t cooperate with federal immigration "detainers" — requests by agents to turn over immigrants subject to possible deportation. Punishment could come in the form of jail time and penalties that exceed $25,000. Opponents of the measure, including the cities of Houston, Austin, San Antonio and El Cenizo, as well as Maverick and El Paso counties, have argued the law violates several provisions of the U.S. Constitution, including guarantees of equal protection and freedom of speech. They are seeking a temporary injunction of the rule, which is scheduled to go into effect Sept. 1. Lee Gelernt, an attorney with the American Civil Liberties Union representing the city of El Cenizo, a small municipality in Webb County, argued that the law, as written is vague and provides such little guidance to officers that they will be forced to use a heavy hand when detaining or arresting someone. That, he said, will lead to a broad assumption that they need to ask nearly every minority their immigration status for fear of violating the provision of the law — the aftereffect of which would be an across-the-board erosion of Texans’ rights. As they have since the bill was passed by the Legislature in May, supporters of the measure said it doesn’t require an officer to question a person’s status — instead, it merely lets them if they feel they need to do so. And it prevents police chiefs and sheriffs from preventing them from doing so, they added, which provides the state of Texas a uniform immigration policy instead of a piecemeal approach. But Gelernt said that the state glossed over the differences between SB 4 and the Arizona measure in an effort to simplify the matter before the court. Gelernt added that in Arizona’s bill, an officer had to alert federal immigration officials if they came across someone in the country illegally. In Texas’ bill however, there is no direction, which is a main reason opponents of the measure have argued the bill’s intent is vague. There was also a heavy focus on whether the bill would subject all state employees to penalties for speaking out against the measure. The focus, to date, has been on elected and appointed law enforcement officials, who would be barred from “endorsing” policies that prohibit officers from questioning a person’s status, according to the language of the bill. But Nina Perales, the vice president of litigation for the Mexican American Legal Defense and Educational Fund, said the penalties could extend all the way down to employees of local entities that have nothing to do with law enforcement, like a community college district. She used an example San Antonio’s Alamo community colleges, which adopted a resolution in support of DREAMers — young undocumented immigrants who came to the country as children. But deputy attorney general Brantley Starr said the endorsement language is “contextual” and that a professor expressing his or her opinion isn’t the same as a board of trustees adopting a policy that restricts campus police from acting. “That’s not Officer Smith in Midland deciding he wants to conduct an immigration raid in a parking lot,” he said. But Perales said there’s nothing in the law that explains that in detail, adding to the argument that its vagueness opens the door to racial profiling. El Paso County attorney Jo Anne Bernal said SB 4 would place the county in jeopardy because of the dueling mandates. Toward the end of the day, the plaintiffs tried to show the bill was rushed through the Legislative process and had an obvious racist intent. State Rep. Ana Hernandez, D-Houston, was called to testify on the process and told the court that SB 4 was deemed an “emergency item” that created a toxic environment on the House floor. She recalled how her colleague Eddie Lucio III, D-Brownsville, warned their Republican colleagues that Hispanic members shouldn’t be heckled that day because they were fed up with what she deemed anti-Latino sentiment. Hernandez also became emotional on the stand after explaining that as a former undocumented immigrant, the debate over SB 4 had a very personal effect on her. And at least one elected official seems hellbent on holding out against enforcing the law for as long as he can: Bexar County Judge Nelson Wolff. The Democrat testified that he hasn't researched provisions in the bill that allow local entities to apply for grants to help them pay for housing inmates subject to a detainer. He said that was because he was hoping the law wouldn't go into effect. He also said he's heard anecdotally that the bill has already affected tourism and, in turn, the local economy. He also scoffed at the language in the bill that would try to silence his personal opinions. "Endorsement means I have a right to say what I want to say," he told the court. Later, when asked by an attorney for the state of Texas how he would like to be addressed, Wolff quipped: "I don't know — you may have to address me as a former public official soon."